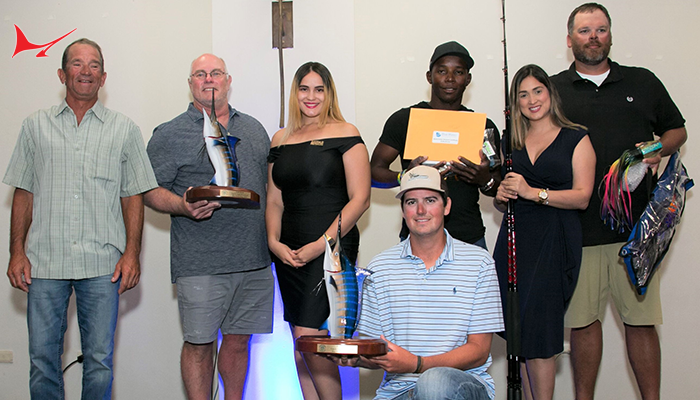 POMPANO BEACH, FL – The 20th Anniversary of the Mercury/SeaVee Pompano Beach Saltwater Shootout concluded Sunday with a total of 124 teams who competed for a cash purse in excess of $185,000. Big prizes and payouts were abound from the kickoff party through the awards ceremony with a 20th Anniversary celebration for the ages! In addition to chasing fish, they were also chasing golden tickets and the chance to win great prizes and cash from tournament sponsors on a 4-foot ‘Spin-to-Win’ wheel! Doing It All/Hardway came into the Shootout gunning for the top team title after a 2nd place finish in 2017. 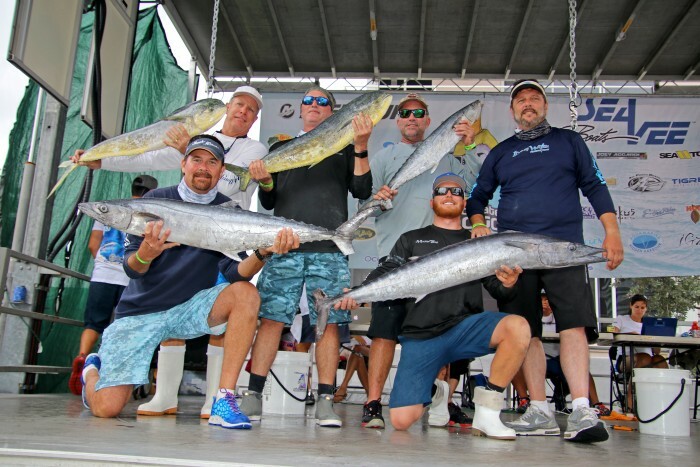 They accomplished their goal weighing in a tournament limit of 10 fish that included 4 kings, 4 blackfin tuna and 2 dolphin for a total of 180.9 pounds. 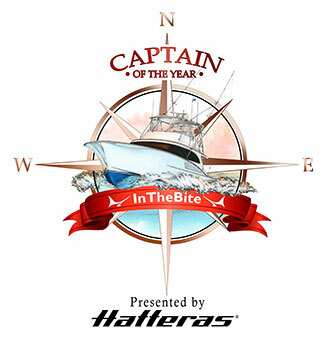 The first place finish earned them a $10,000 check and secured the first place points in leg 1 of the race for the Showdown Crown top team of the year title. Doing It All/Hardway also announced at the awards ceremony that they were donating $1,650 of their winnings back to the tournament charity, the Perry J. Cohen Foundation. This gesture earned them a golden ticket for the “Spin-to-Win”wheel where they scored another $100 cash towards their $21,955 payday!! Gator One placed second in the Shootout with 165.7 pounds led by Top Male Angler, Tanner Easthope. 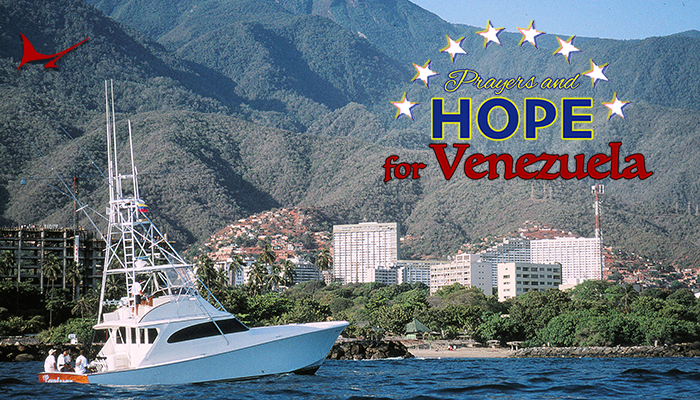 Their winnings totaled $10,552. Keri-N-On finished third with 136.9 pounds, followed by team Advanced Roofing in fourth with 125.5 points and Fenian in fifth with 119.5 points. 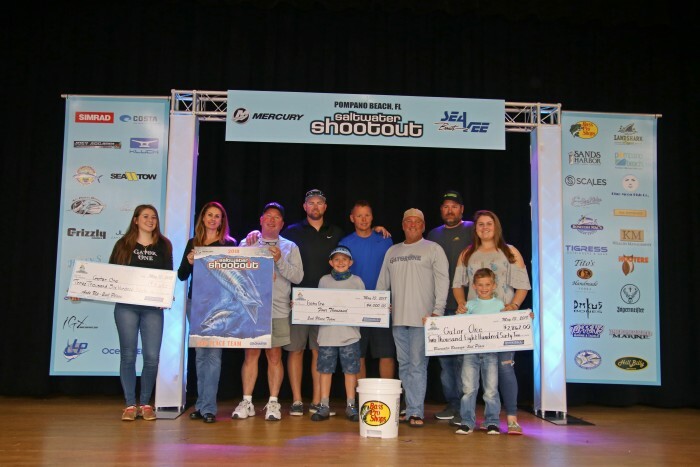 Keri-N-On also won the Non-Pro Division, Show Me The Mahi, and third place dolphin to boost their tournament winnings to $5,000. Living Water/Shockwave cashed in the largest, single payout by being the only team to secure the three species needed for the KDW jackpot! 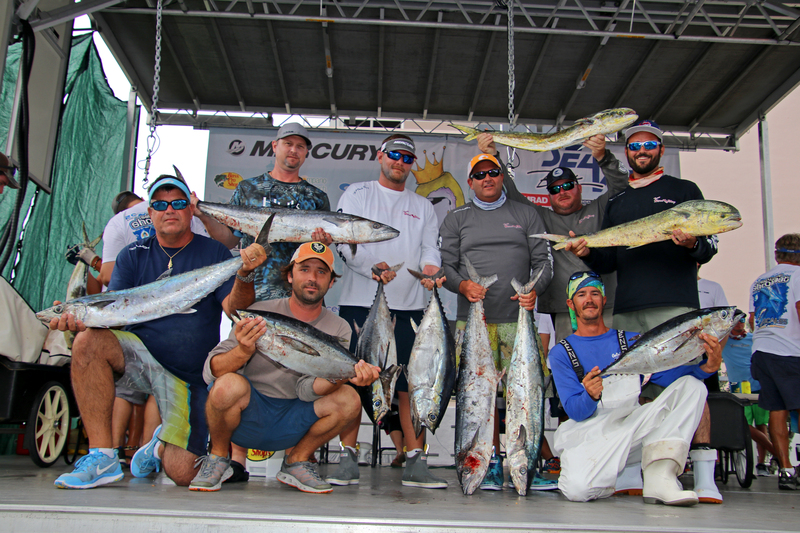 Their kingfish, dolphin, wahoo haul netted them a payout of over $50,000! 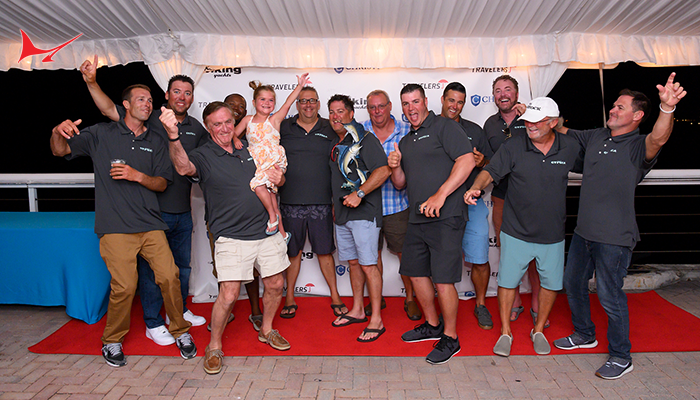 Team Fenian also proved that aggregate weight is not the only way to take home a nice paycheck in the Shootout. 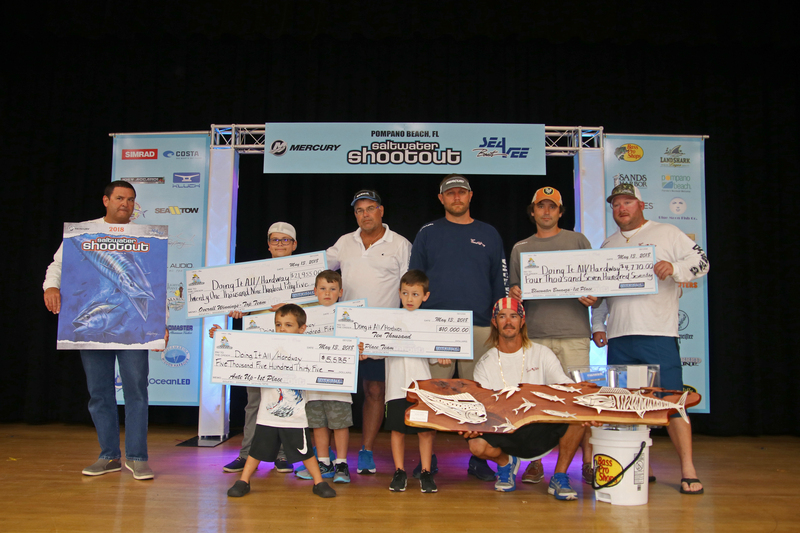 With two kingfish weighing 47 pounds and 42.5 pounds, they took a $30,773 check to the bank by winning the Bluewater Challenge, placing 1st and 3rd in the Big Three and kingfish division, plus 5th overall in the tournament, Top 561 SeaVee team, and 2nd in the Non-Pro Division. Team Contagious weighed a stout king as well. 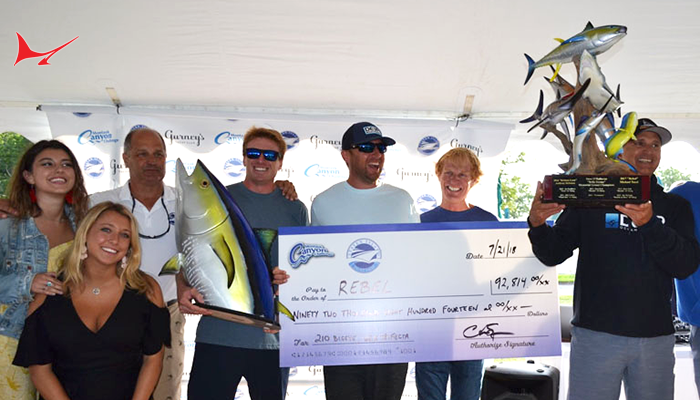 It was the second heaviest fish of the tournament, 45.4 pounds, and bumped them into a number of added value categories worth $14,201. Barbara Lange from team Slob City was the Top Female Angler with 102.9 points. Wyatt Lauretano on Cache Money was the Top Pee-Wee Angler with 61.3 points. 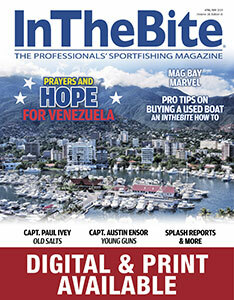 Hunter Irvine on Young Guns was the Top Junior Angler for the second year in a row with 48.8 points. He was also the recipient of the Safety First award in partnership with the Perry J. Cohen Foundation and Bass Pro Shops. 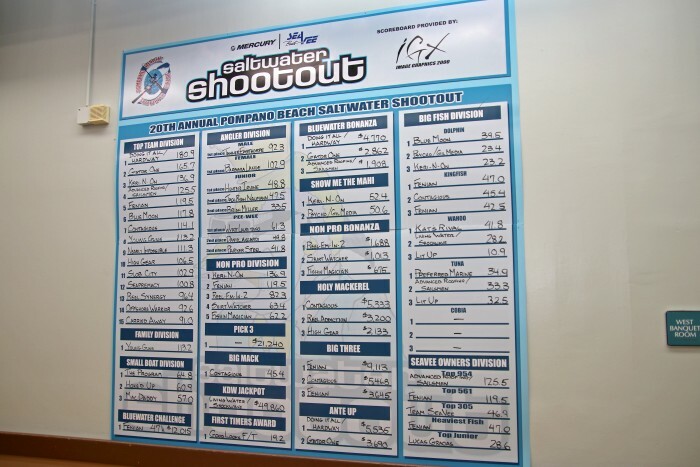 The Mercury/SeaVee Pompano Beach Saltwater Slam is the 2nd leg of the PBSC summer series, which kicks off June 7th-10th. 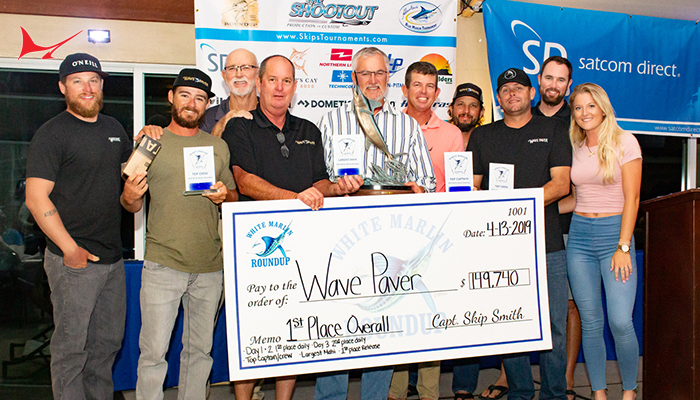 Registration for the Saltwater Slam is currently open at www.saltwaterslam.com The early entry discount deadline is Wednesday, May 23rd.